Follow website reviews from an SEO perspective. With the use of Mombubot.com site owners can get better search ranking! Well, it is time again to investigate why this page received a Mombubot score of only 1 and was still able to get in the top 11. We will also look into what could have been done to possibly get into the top 10. 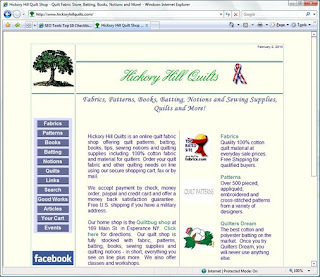 Well it looks like Google certainly categorized this page correctly it certainly is in the quilting space. Using a derivative of the keyword "quilt fabric" scores a much higher mombubot score at 6 which helps answer the question why so high in the listing. Also, based on the design of the site and the domain registration back in 1997 this site has been around for a while which provides some more lift in the rankings. Okay, so what could have been done to get in the top 10. Well there are a couple of very easy things which can be done to help. One of the big impacts could come from changing the order of the text in the Title tag for the page. Often I see the name of the company first and good SEO will put the keywords before the company name as it provides the search engines with a better idea of what the page is about and hence where to rank it. I would also suggest that a move away from the table layout would assist but a smaller change would be to add some header tags around important keywords on the page. Keywords before company name in the title! Don't forget the header tags! The purpose of this review is to provide some insight to web site owners about the structure including SEO and other techniques which make up the website being reviewed. Hopefully you will find some useful information for your own site. The selection of sites will be based on keywords found on mombubot.com SEO Top Checklist A website SEO Top checklist of best practices which I created to help site owners. From the keywords a search will be performed and the website positioned on the top of page two or position 11 in most cases will be reviewed.